With nearly twenty years of hands on experience in the art and custom framing industry and a lifetime of feeding my passion for design, color and textiles, I am distinctively qualified to create masterpieces of display. Custom framing is a craft with all of the challenging characteristics of any other craft. An experienced preservation framer utilizes quality conservation materials and techniques to create a protective display for delicate historic memorabilia and artwork. I recognize that while the framed contents are extremely valuable to my clients, the end product is not likely to hang in a controlled museum environment. Displays must shield against the damaging effects of light, temperature and moisture. The framed article should be secured in a non-invasive, easily reversible manner yet be strong enough to withstand rough handling and storage. Depending on the restoration needs of the a project, I have established a professional relationship with conservation specialists in Portland and across the country. 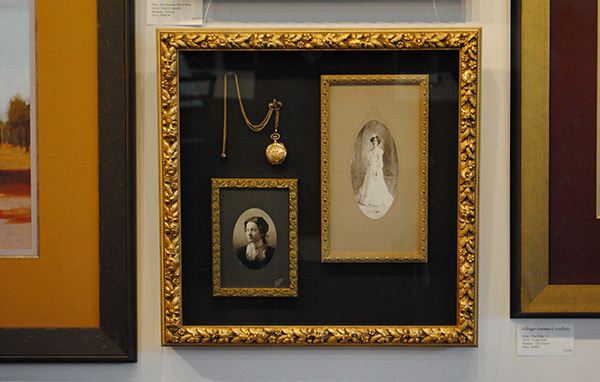 If a client desires the home or office presentation of family heirlooms, personal memorabilia, or high valued works of art, I have acquired the in-depth knowledge of frame crafting, mounting techniques, archival materials and glazing options to safely display and preserve life’s treasures. At the minimum, my design and crafting approach provides the client with an investment that will bring visual pleasure for generations to come. Prior to her interest in custom framing, Deann spent many years assisting individuals, groups, even whole communities, to clarify their needs, visualize the end result, and define their route to success. Her skillful application of the tools and techniques of facilitation are extremely valuable when assisting customers in the design phase of a custom framing project. In 1995, Deann decided to expand her creative skills by learning the art of custom framing. She trained with some of the best in the industry, took guidance from the specialists, and ultimately found herself in the business of custom framing and fine art.